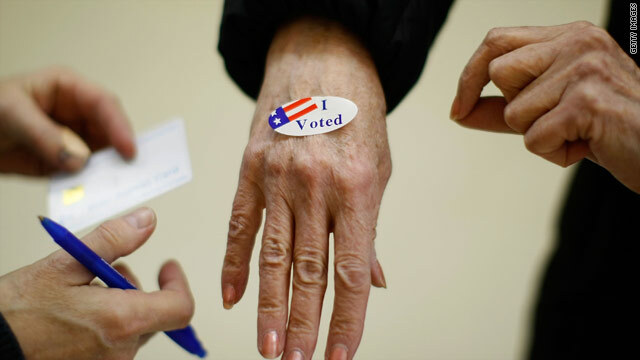 (CNN) - Early voting turnout numbers released Tuesday in two western battleground states show mixed results one week before Election Day. In Nevada, more Democrats have cast their ballots already, while more Republicans have done the same in Colorado, according to the official numbers. In Nevada, nearly half a million voters have either voted early in person, by mail, or by absentee ballot, the Nevada Secretary of State's office confirmed. As of now, Democrats have an edge in the state, with 215,754 turning out their vote, compared to 181,278 Republicans. About 86,840 voters with a different party affiliation have also voted. The state, with six electoral votes, has been highly contested territory. Then-candidate Barack Obama carried Nevada in 2008 by 12.5% over Sen. John McCain. A recent NBC News/Wall Street Journal/Marist poll, however, showed the state in a tight race between Obama and Republican presidential nominee Mitt Romney. The survey, released last week, indicated that the president was ahead by three points in Nevada. The poll marked the latest in a series of polls that show Obama with an advantage over Romney in the state. The picture looks different in Colorado, where slightly more Republicans have turned out to vote. According to the secretary of state's office, nearly a million people have made their pick, about 40% of the total voter turnout in 2008. About 370,990 Republicans have cast their ballots compared to roughly 343,720 Democrats. Meanwhile, about 241,000 voters who were unaffiliated also turned out. Colorado, with nine electoral votes, also shows a tight race. A new American Research Group poll released Monday indicated Romney has a narrow one-point edge over Obama, 48%-47%, in the state. Along with Nevada, Obama also carried Colorado four years ago, turning the state from red to blue and winning by nine percent. Both Romney and Obama campaigned in Colorado last week, and the president was scheduled to return to the state on Tuesday but canceled his plans to monitor conditions related to Superstorm Sandy. - CNN Correspondent Miguel Marquez contributed to this report. Presidential politics is like the game civilization. You have to keep your people fed, happy and safe. Better hope there is NEVER a natural disaster in CO!!! There will be no FEMA with a Willard administration. Just watch him dodge the question as he goes on the trail. LOL. Why doesn't he give the same answer he gave during the republican debates?? LOL. He's making fools of the people of support him. Even Chris Christie is fed up with willard's blatant lies. Do you actually blame President Obama for the downturn in the economy that caused you & your husband to lose your jobs & home since he was elected in 2008? I'm sorry, but Bush & the previous administration caused that cascade of events, not Obama. I believe it was the Universty of Colorado that picked Romney as winning the election. They picked the winner in the last 8 elections. That is why Clinton is going to Minnesota and the polls are close in other states Obama won lat time. The Polls, the Tea Leaves, the Stars all indicate Romney. Have fun. I have faith in Obama. It isn't his fault that the economy is messed up ( compared to Bush). He really can' t make the American Dream happen in 4 years. IT TAKES TIME! My vote is for Obama. He will make a change. If you voted for Romney why r u asking for handouts. There r jobs out there for skilled workers. Does ur husband have any skills or do u peeps have the intelligence of honey boo boos family. Remember u should work hard and not ask for handouts because u put yourselves in your own mess. Dont blame a politician blame yourselves you r a republican now. Live by those principles. Sniffit dont b a hypocrite. Way would anyone want another republician administration?? Seems like a lot of desperate people, believing that one man can fix it all. Very foolish. "I will create 12 million jobs!!" That is 250,000 jobs a month over the next 4 years. YOUR BEING SOLD !! Where were you sniffit? Didn't you see how Obama worked to save our free fall country? We had recession, bank bankruptcy from Bush regime who wants to have war with other which Romney wants to start with China and calling the attention of Russia to continue political war as what Bush was. These people turned this country in bad shape so Obama was fixing it! And more works to be done by this great man... OBAMA! Four more years! I believed in Obama in 08. There is no way I believe in this mockery of the U.S. president in 2012. Guess I am tired of the blaming everything on "W" or whatever this administration can do except accept responsibility for what they have done to our economy and more importantly our international image. Being active duty it's even more hard to swallow these things. Do to the fact that I will follow all orders of the commander and chief. I am in Texas and I voted for Obama. I know he won't win the state but I don't care. The country is moving forward. The most obstructionist Congress ever. From day one they wanted him be a one term President. Well he wouldn't be so what political advantage would Republicans have since Obama couldn't run again. Voter ID laws disguised as voter suppression laws to discourage certain groups of people to vote. Racists. Yes I said it. There a a good number of white men who will not vote for Obama because white men have ruled this country from the beginning and they can't handle the fact that a black man is their leader...by the way I am a white male. And please spare me the blacks are only voting for Obama because he is black. Blacks have been voting for Democrats in huge margins since Clinton. I also think a big reason blacks are still voting for Obama is they see the subtle racial digs at the President. Shuck and Jive, he needs to learn how to be an American, implying only blacks receive welfare, etc. I am sure Four and the Door, Myviews, Ray E and Borderless (who I think is the old Truth and Nothing but the truth will "correct" me and give me their Romney stump BS. Our founding fathers gave the power to the staes for a reason. this is a democracy, not a theocracy.... have you ever worked with government "employees"? OBAMA 2012. Come on Colorado vote OBAMA. Look at the mean hurtful comments like Sniffit. Racist! Republicans are just mean and nasty people. 4 more years! 4 more years! Romney is taking it by a landslide. Even check the stupid things like vegas odds. They just doubled down on Romney. As long as the Liberals stop tampering with votes it shouldn't even be a contest. Looks like Nevada is going to go to Obama. Not only is he ahead now, most Latinos vote on election day and will put him over the top. Any swing state that goes to Obama is a dagger to the heart for mitt. Obama keeps Nevada, gets Ohio, and Wisconsin and Obama wins. When discusing polls CNN rarely gets intot he issue of the Latino or Hispanic vote which has relevance in both Nevada and Colorado where Democrats gave 30 % plus lead of those voters. Romney cannot waste time going here as if he loses Ohio/or Florida its over. So he stays in Ohio Wednesday and the off to Florida again and even if he wins both Obama can still realistically hope to win electoral college wise. Romney cannot without winning one or preferably both. Let's go Romney in Colorado!!! I don't support Obama b'cos of the way he is only looking into the interest of other nations to gaining power, this is very dangerous gas the world has not reach that stage yet. So Americans can't get an intelligent young White to challenge Barack. OMG. Am proud of Black folks, even though am White. I actually feel that Obama has done nothing for my family the last 4 years after voting for him and change. History shows that second terms don't get better so it's time to give someone a chance. I don't want another 4 years of my life like the last 4 when he said he could make change in 3 years or he would be a one term president.